PESHAWAR: As the deadline for repatriating Afghan refugees to their homeland expires on Sunday, the federal government is likely to extend the refugees’ stay in Pakistan. The interim government had extended the stay of Afghan refugees for three months in June this year. The extension period ranged between July 1 and September 30. Officials privy to this development maintain that during a recent meeting of the federal cabinet, information ministry officials had contended that the stay would be extended until June next year. But this was not communicated to the donor agencies, specifically the United Nation High Commission for Refugee (UNHCR). “This was discussed in the [cabinet] meeting by the federal minister for information. However, no other stakeholder was sent any official notification [in this regard],” a senior official dealing with the issue told media. The official stated that the UNHCR mainly dealt with registered refugees and those who were issued ‘Proof of Registration’ cards. “It is likely that the government [will] make this announcement on September 30 [i.e. today] after the expiry of the extension date otherwise even the registered refugees will be facing immense problems,” another official said. “A notification in this regard has not yet been issued by the federal government,” the official said. UNHCR’s head in Pakistan Ruvendrini Menikdiwela expressed the hope that the government would extend the refugees’ stay. She said that discussions in this regard had already been held with the prime minister, the foreign minister and other senior government functionaries, including the Chief Commissioner for Afghan Refugees. Officials of the Afghan commissionerate had stated that nearly 1.4 million refugees had been issued ‘Proof of Registration’ cards and were being managed by the UNHCR. 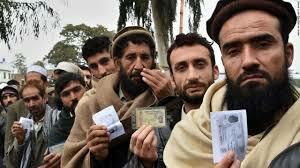 Speaking to media, an official said that there were 880,000 refugees who had been issued Afghan citizenship cards under the National Action Plan for registering undocumented persons living in Pakistan. “Almost 500,000 Afghan refugees living in Pakistan are still undocumented,” he added.